The breech block, or bolt as some insist on calling it, is made from one and one-half inch round stock that is three and one-half inches long. It should be made from material that can be hardened to prevent battering or undue wear. If commercial steel is available, then buy a type that you (or someone with the facilities) can harden to between thirty-five and forty on a Rockwell "C" Scale. If none is available, then you will have to take your chances on something like a truck axle. Tractor transmissions sometimes contain shafts suitable for this also. At any rate, a suitable piece of material is chucked in the lathe, with the end squared and true. A counter-bore of sufficient diameter to accept the cartridge head should be machined in the face of the breech block. 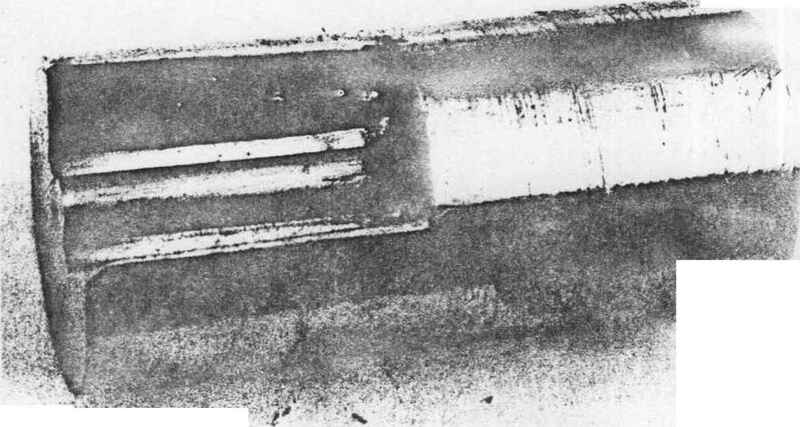 For the nine millimeter Parabellum cartridge, this counter-bore should be two-fifths inch in diameter by one-tenth inch deep. 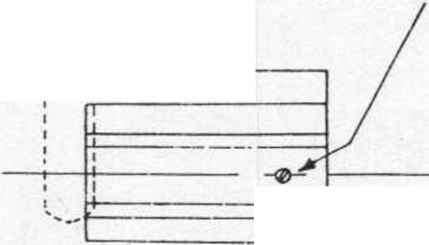 A firing pin of .055 inch to .065 inch diameter, with a protrusion of not less than .050 inch or more than .060 inch, must be located in the exact center of this counter-bore. This firing pin may be made in several different ways. It may be machined directly on the bolt face as thecounterbore is formed, made separately and held in place by a threaded bushing, or made separately and threaded in place. The latter method is the type I prefer since it isn' t too hard to make and is easily replaceable if it wears down or breaks. Therefore this is the type shown in the drawing. Drill a hole to receive the firing pin with a Number 26 drill, rjaking it one-half inch deep with a flat bottom. A flat pointed (square ended) drill may be ground and used after the hole is drilled to depth to form the flat bottom. 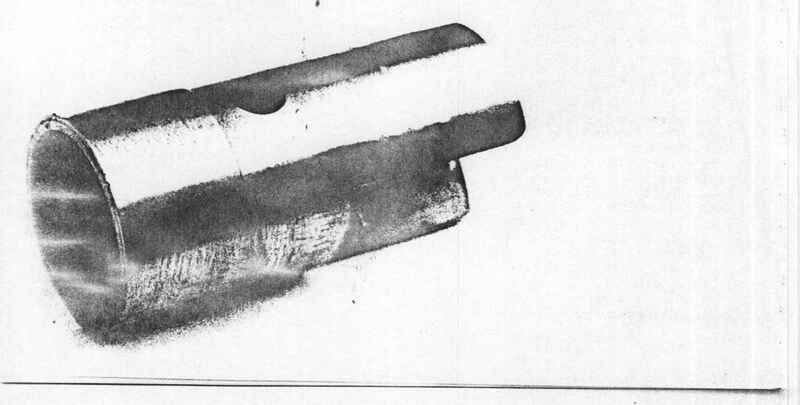 rim of the firing pin body. Then thread the hole with a three-sixteenth inch by twenty-four tap. Of course you know to start with a taper tap, since the taper allows the tap to easily enter the hole. After taking a cut with the taper tap, remove it and take a second cut with a plug tap. Following this, use a bottoming tap to cut the thread as close to the bottom of the hole as possible. The firing pin may now be made. It may be turned from suitable one-fourth inch round stock, such as drill rod. Since it may be hard for the inexperienced machinist to hold and cut threads on such a small part, a steel three-sixteenths inch by twenty-four bolt may be used. The one-fourth inch by one-tenth inch flange is formed from the head, with a hemispherical one-sixteenths inch firing pin machined in the center. Drill two opposing one-sixteenth inch holes, one on each side of the firing pin, from .080 inch to one-tenth inch deep and make a suitable tool to attach and remove the firing pin using the afore-mentioned method. I suggest that you go ahead and make up at least one spare firing pin now while you are set up for it, since you will probably need it somewhere down the line. Tightly screw the firing pin in place, using the tool you made for this purpose. Hopefully, the forward flat will be flush with the bolt face. If it is not, the breech block should be chucked in the lathe so another cut can be taken across both the firing pin body and the bolt face. This should result in a smooth, flat bolt face with only the firing pin proper projecting. Now reverse the breech block in the lathe and bore the rear end to a one-tenth inch wall thickness to a depth of one and three-tenths (1.300) inch. After doing that, drill another hole one-half inch deep with a three-sixteenths inch drill. A cocking lever retainer is needed to enter this opening. It may be made either in one piece or with the 1.295 inch portion turned to a one-sixteenths inch wall thickness. The bottom left portion should be turned to a one-eighth inch thickness. Drill a three-sixteenths inch hole in the center of this portion and either thread or weld a three-sixteenths inch diameter by one-half inch long plug in place. A three-eighths inch hole should now be drilled on the exact center line of the bolt body, one and nine-tenths (1.900) inch from the front bolt face to the center of the hofe. It should be one and one-fourth (1.250) inch deep. The cocking lever fits into this hole. : . i: - tr ; v.-; * • * •■; f? 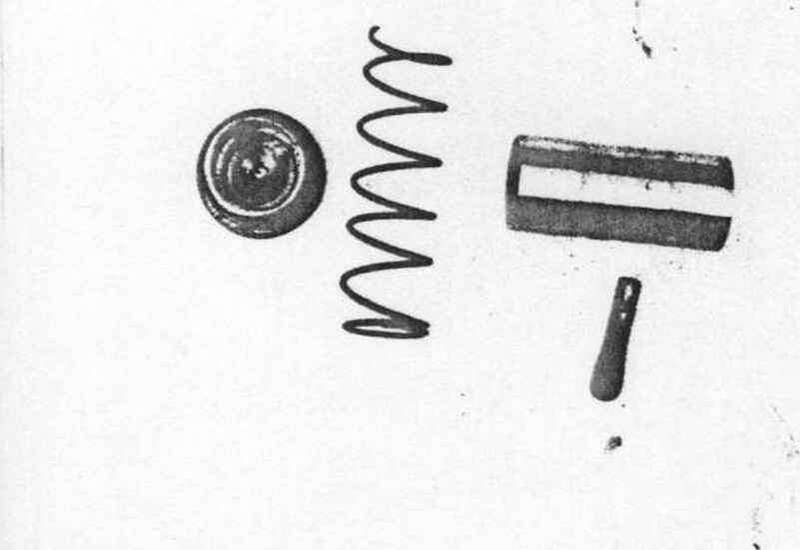 The breech plug, mainspring, breech block, and cocking lever. this part is to insert the rod in the hole in the bolt body. Run your three-sixteenths inch drill into the hole you already have in the rear center of the bolt body and drill through the cocking lever material, thus making an opening for the cocking lever retainer. The end projecting from the bolt body should be flattened and formed with a slight forward curve, with the end tapered and rounded off. The inner curved surface should then be checkered (there are metal checkering files available from gunsmith supply houses) or stippled, matted, or otherwise roughed up to help prevent the fingers from slipping when cocking the gun. An additional one-eighth inch next to the bolt body should be left full diameter to fit the cocking lever in the receiver. Now we will begin the most difficult operation of the entire job. The breech plug, mainspring, and breech block as they relate when assembled. on each side. Draw these lines parallel to the center line from the front edge of the breech block to a point one and seven-tenths (1.700) inches to the rear. Draw anotner line connecting the two. Now, scribe another series of parallel lines one-eighth inch inside these lines at one-eighth inch intervals. A template may be made either from the drawings or by measuring directly from the magazine you intend to y use. 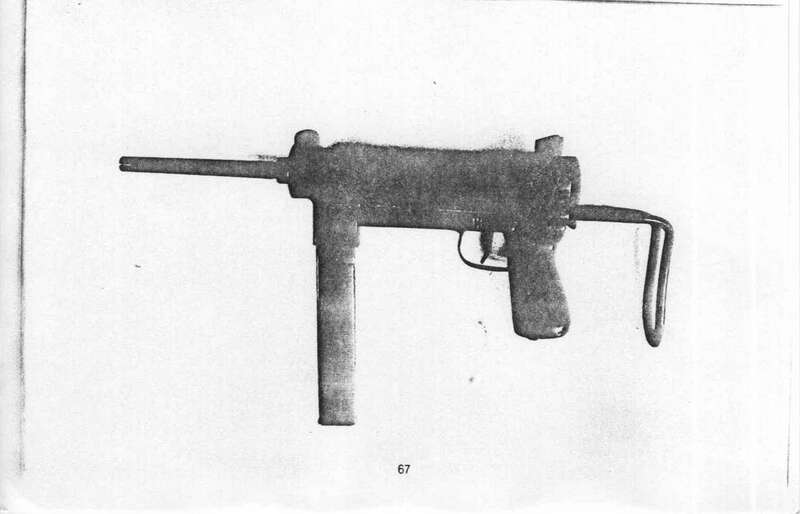 The template and dimensions shown in the drawings are correct for a Sten gun clip. An outline of the opening to be made should be scribed on the bolt face. How to make a breech block for a submachine?